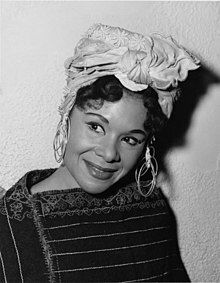 If you aren’t familiar Katherine Dunham is a world renowned dancer, choreographer, social activist and recognized cultural anthropologist; she is the mother of Afro-Caribbean modern dance. She set the tone for many of the performers we know and love today; there would be no Janet Jackson, Beyoncé or Ciara if not for the dance contributions and choreography style of Katherine Dunham. Through her anthropological studies and life, Miss Dunham helped guide Afro-Caribbean dance to the forefront of the dance world through out much of the 1930s to late 50s. Katherine Dunham was one of the most gifted dancers of her generation, she stood against the odds and made a name [all over the world] not only for herself but countless other African-American dancers. Dunham wasn’t just a superb dancer but an educator who used dance as a tool to bring about change in the hard streets of East, St. Louis. For many years she taught students ‘movements with meaning’ and built the Katherine Dunham Center for Arts and Humanities as a place that every child, young adult and person could receive exposure to not only dance but an experience in cultural education. Conncet with the Katherine Dunham Center for Arts and Humanities on facebook. Another gem from the futuristic queen of soul Ms. Janelle Monae!!! I am America. I am the part you won't recognize. But get used to me. Son Of Life: A Mini-Documentary from JUKEBOXDC on Vimeo. Today is #tbt and we thought we’d take it back a ways and highlight community activist, Tony Lewis, Jr and his Sons of Life fam. Let’s get into this video and salute them for being out in the community serving the greater good of the District. Be inspired. Stay progressive and leave a lasting impression.